Diode Laser Hair Removal DeVon is the World’s 1st Fiber Coupled 810nm Diode Laser for Depilation. The FDC laser locates insude the mainframe instead of handpiece. 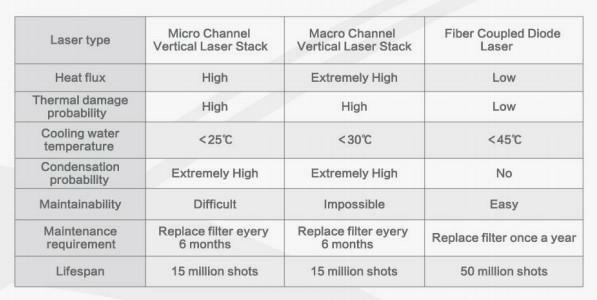 Therefore, laser energy is transferred by fiber to the target, which significantly increases the energy efficiency and handpiece life span. Lighter handpiece make it more convenient for operators meanwhile sapphire touch cooling system can cool the tip rapidly, providing patient a safe and comfortable treatment. Fiber Coupled Diode (FCD) technology. Fiber Coupled Diode(FCD) technology refers to micro lens array coupling the light generated by multiple diode laser into a single-core multimode ﬁber, transmitting the light to the target place.This innovative design assures uniform energy distribution, low damage rate, long lifespan and easy maintenance of the diode laser. “Jet Smooth”. A high repetition rate of short pulses are delivered deeply into the dermis, achieving high average power and therapeutically effective heat build-up, with virtually no pain. The “Jet Smooth“ technology of sliding the handpiece repeatedly over the treatment area ensures full coverage, while sapphire touch cooling system cools the skin surface rapidly to prevent superﬁcial burns. 810nm diode laser is the gold standard for hair removal. Light at the wavelength of 810nm is mostly absorbed by melanine of hair follicle and greatly reduce the absorbtion by water and oxygenated blood. Treatment is safe for epidermis. 1st Fiber Coupled Diode Laser for depilation. FCD technology is used for depilation, which ensures the machine competent for high strength and harsh working environment. FCD laser could work under high temperature and high moisture, which prolongs the lifespan of laser generator signiﬁcantly. Touch cooling system. Sapphire touch cooling technology assures reliable and constant cooling result for skin surface with maximum comfort and safety. Maximum energy target on follicle with less consumed by tissue. The temperature of 0 C to 5 C further increase treatment comfort. Ultra light handpiece,high efficient operation. The handpiece is much lighter than vertical laser stack handpiece. Operators feel more comfortable during long time operation.The spot size of 12x12mm is accessible to fast and efﬁcient operation on big area. The released energy makes excellent results on every inch of skin where hair removal is required. Uniform energy distribution. Fiber coupled diode laser is designed with a uniform energy distribution at a small divergence angle to ensure more gentle & effective depilation. generator, the decreased heat flux effectively prevents the thermal damage to laser generator. Meanwhile, DeVon is driven by high voltage but low current, which improves the power efﬁciency and reduce over-heating.